sharing God’s love while seeking spiritual growth. For you we have been praying. Sunday School begins during worship service for children. There is time for fellowship after the service, at 11. Christian Education for Adults begins after worship at 11:15 a.m.
Our congregation is open and caring, and always happy to share the love of our church family. You will find our worship nurturing, our service vital, our congregation friendly, and our fellowship genuine. We welcome you to join us at Peterborough United Methodist Church located in the heart of the beautiful Monadnock region of southwestern New Hampshire. You will find our church friendly and nourishing with a vital music ministry and Christian education. Our congregation is open and genuine, and always ready to share the love of our church family. Read more about us. Worship at Peterborough United Methodist Church is vital and alive with a selection of hymns; powerful anthems; praise and prayer; and uplifting, approachable bible-based messages to strengthen our walk with Christ. We are blessed with a vibrant Reverend who brings the scripture to life. We also offer recordings of our worship service on our web site. Read more about our worship. 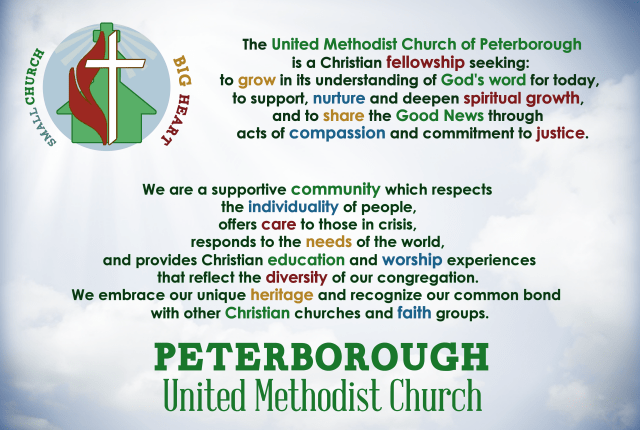 Peterborough United Methodist Church is active in our community. We are engaging in service locally and abroad with the assistance of diverse aid organizations. You are invited to learn more about these organizations. We are pleased to involve the whole congregation in our missions and outreach work, including our youth – we are all on the missions team! Read more about our missions.